Chances are, your phone—yes, even your iPhone—supports Stereo Bluetooth, but not that many people actually use the feature. We've gathered up the best A2DP headphones to either a) figure out why, or b) ask, why not? Honestly, there are plenty of reasons to be uneasy about Bluetooth headphones: They run off battery power, so you need to be mindful of keeping them charged; they're often styled strangely to accommodate the necessary wireless hardware; they're more expensive than equivalent wired headphones; and most of all, they sound like crap. Or, so you've heard. You know, from other people, not with your ears. The colloquial "heard." Er, you know what I mean. The Advanced Audio Distribution Profile, or A2DP, is an umbrella term for the modern Bluetooth audio profile, meaning the standards by which Bluetooth devices send a receive audio. It complements the Headset Profile (HSP), which takes care of low-quality mono transmissions, like those to single-ear Bluetooth headsets, to provide the capability to listen to music without too much distortion. And that's the crux of the A2DP problem, both real and perceived: It's better than mono Bluetooth, to be sure, but is it as good as a wired headset? Or more realistically, is it close enough that it doesn't really matter? The only cup-style headphones included in this roundup, the Sonys serve as a sort of reference for sound quality, features, fit and comfort. Also: impracticality. If you're planning on using a Bluetooth headphones as they're generally understood to be intended, you're probably not looking for bulbous headhuggers like this. That said! They've got by far the bassiest, clearest sound of the lot, and the included controls, though they can take a while for your fingers to map out, are more complete than any others. Using these headphones is a joy compared to most others, but only in a situations where they're appropriate: Sitting on a sofa? At a PC? I don't really know. Whatever they're meant for, the lack of a USB charger corroborates the theory that they're not really intended to be that portable. Something about this headset is immediately alarming. It feels cheap, it comes with very few accessories, it even looks a bit dated—it sort of feels like you've accidentally been handed a stray accessory, dropped out of a Motorola Rokr box, yearning to be reconnected to its parent phone. But seriously, give it a minute. You could find plenty of things to complain about with the s305s, but hell, I just don't want to: With these cheap, stripped-down headphones, Motorola shows that they understand the draw of A2DP better than anyone else. They sound fine—solid mids, relatively clear highs, adequate bass—without sounding overequalized; their fixed fit works well enough on most heads, without sacrificing weight or durability; they connect with ease, and offer minimal, though adequate, controls; they charge quickly via USB, for a playback period that'll outlast any workout session. And most of all, they're very, very cheap. Nobody's going to dispute the Halo's stylishness, especially in this company—most of these headphones looks like they were designed in the late 90s (Why? No really—this doesn't make any sense) and many come in form-factors I haven't seen since I carried a Discman. For what it's worth, the Jabra's matte black, ultra-thin headband take on Bluetoothery is eye-catching, and there's nothing expressly wrong with it. Logitech's gone all-out with the Freepulse, and you'd be hard pressed to find a hardware feature—aside from USB charging—that these things don't list on their spec sheet. They've got by far the most versatile Bluetooth transmitter, meaning that they can be paired with just about any device comfortably. Controls are subtly built into the earpieces, but once they've been explored, they're easy to reach and utilize during exercise. I found the fit to be a bit strange, since these particular headphones, despite looking like a traditional wraparound headset, actually hang on your ears by means of floppy little rubber loops. They're secure enough, sure, but they don't exactly cram the drivers against your ear holes; hence lack of great bass. Oh and hey, no mic! These things aren't cheap, so, uh, what the hell? At this price, where's the mic? In a lot of ways, the i222 is a cheaper, newer equivalent to the Freepulse: Its design looks newer, albeit a little Bluetooth-headset-y, its feature set matches the Logitech's almost point for point, and, crucially, it has a mic, because almost every A2DP-enabled playback device is, let's face it, a phone. 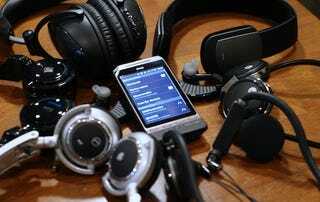 Interestingly, the iLuv's battery life trumped even the most expensive headphones in my limited testing. My main cause for concern is a generally plasticky feeling: I can already see multiple areas of concern on the headset, and online reports go some way to confirming my worries about durability. If all these evaluations sound a little bit tentative, that's because they are. Each headset evaluation was underscored by a fundamental discomfort with A2DP because, well, it's not that good. Don't get me wrong, it's better than I expected, and a far sight better than you might predict if you were weened on Bluetooth earpieces. But the sound is flat, lacking in bass range and sacrificing detail on higher tones. And even if these headphones are specifically tuned for playing back Bluetooth streams, the few that include direct line-in support, like the Jabra Halo, give you a ready-made comparison between wireless and wired sound. Spoiler: It isn't all that flattering for the ol' toof. This casts A2DP headphones in a different light, not as a viable, wireless, futuristic alternative to regular headphones, but as a degraded, battery-hungry, expensive compromise. You buy them because you need something wireless—that's it. There's no other reason. As such, the headset I'm most comfortable telling people to buy is also the cheapest. There will be people who'll want something else—the Sonys are the best bet for, say, a PC gamer, and the iLuvs are an obvious choice if your music-listening devices don't actually support Bluetooth. But more than anything, I see A2DP headsets as a way to listen to music during a run, or on cable-averse exercise machines, as a way to listen to a charging device while you wander around a room, or as a way to merge your everpresent Bluetooth headset with your earbuds. For this, the Motorola s305s fit the bill: They're light, functional and simple. They sound fine. They look OK. They sync with almost anything. They win because they do as much as you can ask of Bluetooth headphones, and they do it on the cheap.